You are here: Home / Crochet Other / Reviews / I tried FotoJet for FREE and so can YOU! With so many options online now-a-days it is often hard to weed through them to find the photo editors which really have all the features you want and need. I have used one photo editor for a very long time and I have been fairly satisfied with its features – which I pay for. Sometimes I wish it had more features – more templates – different clipart and different backgrounds – and more fun fonts…but otherwise I have been very happy with it so I haven’t really searched for an alternative. A few months ago, Candy contacted me from FotoJet and asked me if I had ever tried their free Online Photo Editor. I hadn’t so I decided I’d go take a look. I was super surprised by the free features they have available. The Classic Collage Layouts include the option to easily choose how many photos you want in the collage and provides suggested templates. All you need to do is add your photos and you are done! Plus a full selection of Photo Card Collage Templates for most occasions. There are 14 different categories so far in the Photo Card Collage Templates. Why pay for someone to create your social media headers when you can use this free service to make your own? Each of these headers is already sized to the specifications of the Social Media Site it is designed for. I created this for Facebook (I’ve modified it a bit since because the Facebook sharing buttons covered part of it and it was bothering me! but I still used this design in the modification). As a Blogger I also love these templates which are perfectly sized for social media posts! The final category FotoJet has available is the Edit category (which is new!). In the Edit category you can edit your photos! You can use a variety of different editing features, including advanced features like sharpen, dehaze, vignette, noise and focus. 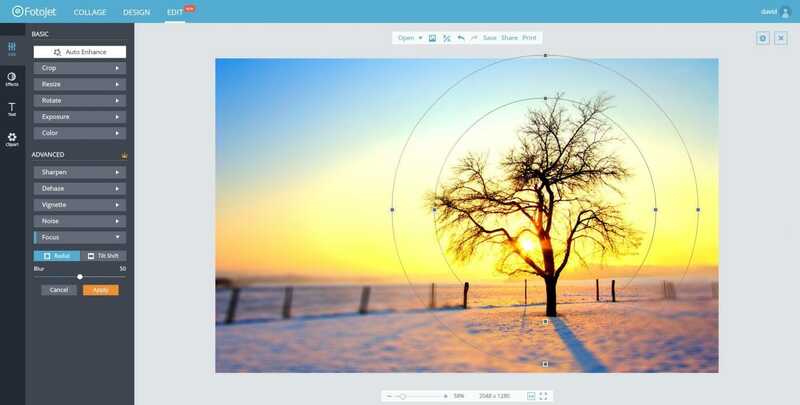 You can choose to Auto Enhance the image too – making it a one-step photo edit. You can also use the A/B compare feature while you are editing to check out the changes you have made to see if you prefer them to the original. On the side edge you have access to other features such as Effect (ie. black and white, sepia, vintage, chromatic, lomo, old photo, scene), you can add Text (with super cool options and fonts! I especially love how you can make the font bigger or smaller with the + or – buttons!) and you can add clip-art (lots of clip-art – more than 93,000 available in the Design option) right in the editing option! 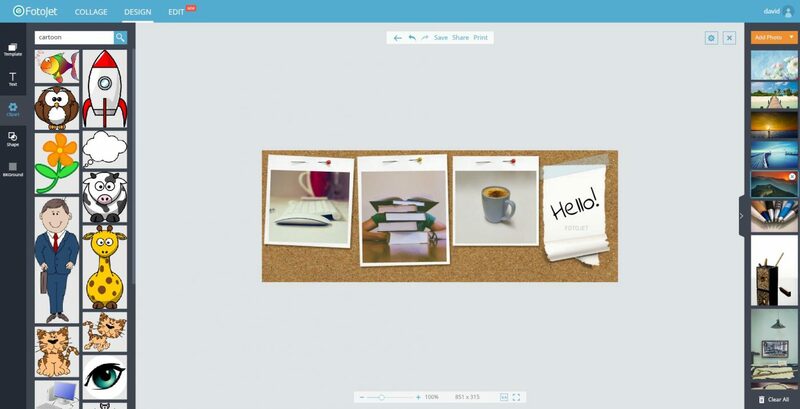 With everything you create or edit on FotoJet you have the option to Save, Share or Print your file. 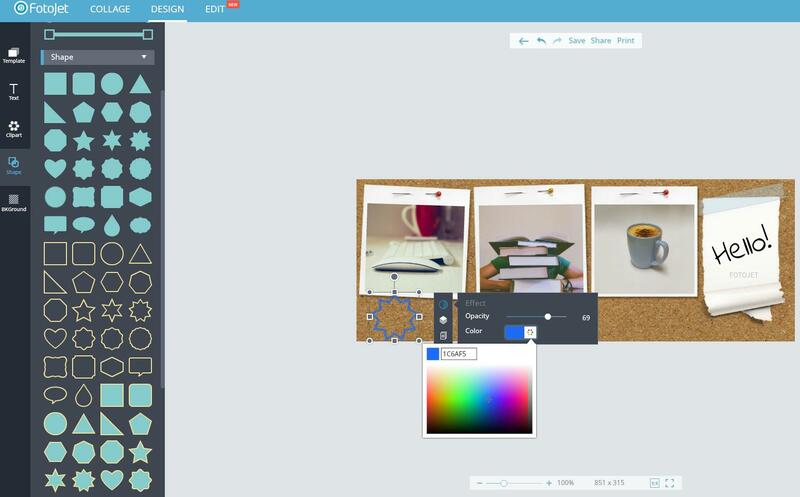 You can share to Facebook, Pinterest, Twitter and Tumblr right from the Photo Editor. When you check out all you can do with FotoJet you may be making the switch to their free service too! It is too fun to play with though so make sure when you go – you have ample time to use each of the free options. To make it easy to try they have even preloaded some images for you, so you can ‘edit’ or use them in a collage, or design – this way you don’t need to add any of your photos straight away. You can just have fun with theirs! To use the features with the small orange crown you do need to sign-up for a free account. You can sign-up with Facebook (which I did because I honestly did not want to try to remember another password) or create an account with your email address. I have been using the services for 3 months and I have not received any spam emails or crazy postings on my account. 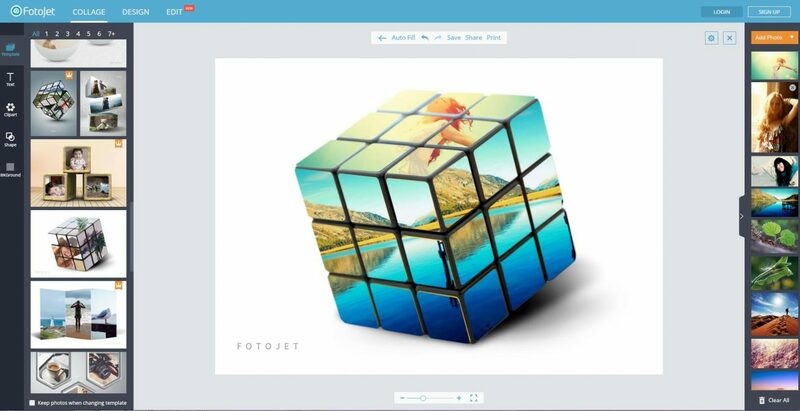 Once you visit FotoJet you may want bookmark this great tutorial which will walk you through the basics: FotoJet Getting Started Tutorial. I’m off to redesign my Google+ and YouTube banners now! I too am always looking for a great photo editing program to replace my $10+ per month for Adobe Photoshop. Don’t get me wrong, I love, love Adobe products, but am only inches from retirement and need to start cutting corners now so I can continue to do my favorite things (crochet and quilting). I look forward to trying out this program, thanks for the review and to the software company, Rhondda’s review is what has made my decision for trying out your product. Kudos to her, for ALL she does. Thanks again Rhondda.